Congratulations you’ve arrived on the deck of your control panel. We’ll be taking off in a few minutes. Please take a seat and look around the Dashboard, these are the controls in your jurisdiction as the administrator of the site. You will be logging into your Website dashboard frequently and you could arrive in the dashboard and see an update for WordPress is available. Always make sure you’re running the latest version of WordPress. Now about the Theme you just bought, it should be installed and ready to go. When you don’t know, you don’t know. Sounds obvious until you find out what the problem is. There are so many themes in the marketplace it is overwhelming. What’s the deal with Themes? It’s a big deal today. There are now so many Themes you have no idea which one is a good Theme. You’re looking at the finished product. The issue isn’t the Theme, but can you operate it. A theme is a customized modification of WordPress core software. It has a specific design and layout for a particular type of business. The theme is readymade. If you like the design you purchase the Theme. The theme comes with a one year license. At the end of the year you must renew the license, or buy another theme. Another way of doing this is to find a reputable theme company that provides updates to your Theme without you having to change themes every year. Your relationship with the company that built your theme should include communication, documentation, and technical support at no extra cost. All these decisions should be made before you start working in your website. It’s too late when you need to update WordPress and your Theme breaks. Switching Themes is a bad practice. I’ll say it loud and clear. It’s true you don’t lose the existing content in the site. The problem happens in the back end. A theme has custom code, so if you switch themes, the custom code of the theme you switched to isn’t the same as the one you were using. The customized code was done by two different people. the result is incompatible code and endless problems and it get’s expensive. Now that we’ve solved the theme issue, and you’re not in the position of needing another theme… if you are read this article on how I solved my website dilemma. WordPress is well thought out and built for the user. 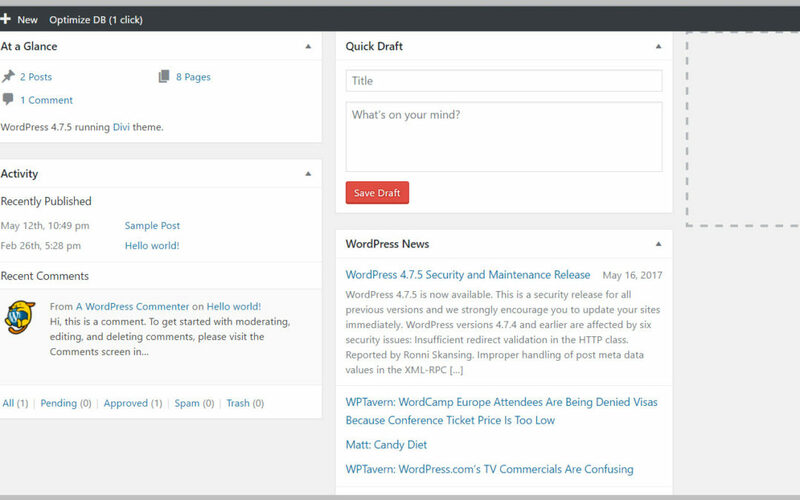 The first module tells you how many posts, pages, comments, and which version of WordPress is currently installed and the name of your Theme. You will receive updates and news about WordPress. Every WordPress website is linked to the WordPress core software. If there is a serious problem with WordPress you’ll get a notice, keep this module in the dashboard. There are settings that need to be in place not obvious from the main Dashboard. The first place to go is the Settings tab. When you hover over the Settings command you’ll see the menu of the different settings. There are two lots of settings you need to set. So let’s get settled on what we have to set. General, writing, reading, discussion, media permalinks. These are WordPress settings and are different from your Theme Settings. I know, it’s strange at first, but there’s good news; the WordPress settings once they are in place don’t have to be changed unless you want to modify a setting such as close the blog comments. You’ll need to familiarize yourself with the different areas within your site. 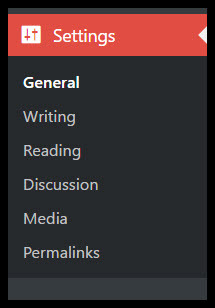 The WordPress settings are different from the Theme Options area. WordPress is the software that drives the site. The Theme is the decorative overlay that enhances the content in the site. In the Divi Theme you have built in options to change the settings and display the content professionally, and add a subtle artistic flair. Your WordPress Theme may have the settings in place and you don’t have to do anything. If you bought the Theme from a reputable Theme company the accompanying documentation will explain what settings to implement before using the Theme. I call this good web housekeeping. When all the settings of your Theme and WordPress is setup properly, then you can get to working on putting the content into the site. If you don’t know how something works “mouse around,” just click on icons and see what they do. There’s very little damage you can do because the code works in the background while you figure out what something does. This is the DIvi Theme Options area. You have to go through all these settings to make sure they are enabled. There are no shortcuts with a website. The setting is either enabled or disabled. For example, if you didn’t enable the Divi Gallery in the Theme Options section you cannot select which items you want for the picture gallery display. I have used the Divi Theme since it came out in 2013. It is such a versatile theme, I have no need for another Theme. The Divi Theme is built by Elegant Themes. I’m a front end user and know very little code. I’m also the kind of person that will read the help menu and watch video documentation until I get an answer to my question. If I can’t solve the problem, I’ll open a support ticket and get help from Elegant Themes technical support. Here’s the thing with technology, things go wrong, and it isn’t because you don’t know. Software malfunctions and can have errors. Nothing is perfect in the world of technology and websites. It’s just the way it is. The good news is someone from tech support can answer the question and the problem gets fixed. The bad news is if you have to keep paying someone to fix a problem with your Theme. A reputable theme company will be there when you need tech support and won’t charge you extra because your level of support needs an upgrade. With your theme purchase comes a license to use the Theme for one year. Make sure you’re familiar with how your Theme is updated and how often. Some say it’s not necessary to update a theme, others say it is necessary. I say an outdated theme is a vulnerable to being hacked. Don’t leave the backdoor open, anyone can walk in. The plugin is awesome. It can do these things for you, so you don’t have to do them. While this is true, you need to know about plugins even if you’re not a developer. Most of us aren’t and get caught in the crossfire of technology “experts” who will sell you the latest, greatest, new gadget for your Website. A plugin is software added into your website. When was the plugin published? Is it compatible with the latest version of WordPress core? Is there tech support for the plugin? Mouse around the developer’s website. Read their About page. There are good and bad developers. You don’t need a plugin for every function. If you have too many plugins loaded into your website you will bloat the site. This causes a collision of the codes used by the developers. A plugin developer might work with a Theme company. In this case the plugin won’t have any problems with your Theme because it is built for that Theme. You still have to know how the plugin works and initiate the settings. In the WordPress Dashboard you go to the Plugins area and you’ll see a list of the plugins in your site. Go to the Plugins section inside your Website. Click on Add new. This is where you will find the plugin directory and where you add the plugin to your site. A plugin has to be approved before it can reside in the repository and be available. The Repository has 44,000+ plugins. Choose wisely. You always want to be in the know, and ask questions. WordPress is not easy and there is a definite learning curve with the software. Once you know where a setting is you enable or disable, turn on or off. Be patient, some of the most complex problems happen with websites because a setting wasn’t enabled.